Another ABLLS-R aligned resource. 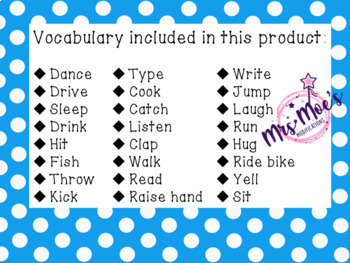 It includes 24 vocabulary words. There includes visuals with real pictures to make velcro tasks to use as independent work or for teaching actions. Included is a data tracking sheet organized by each page so it is easy to collect and monitor data. There is also a sorting worksheet included in this product. 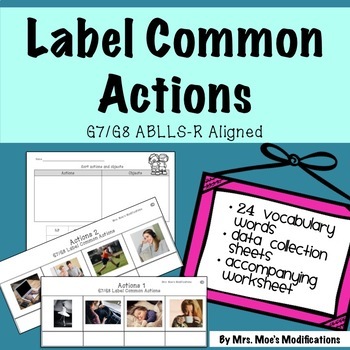 This worksheet sorts actions and objects (object vocabulary taken from previous ABLLS-R tasks). Please be sure to rate my product so I can better improve my store! Thank you to some of the following for help in making this masterpiece!